BACK IN THE ELEMENTS … Two weeks after the outdoor game in Philadelphia, the AHL heads back outside to make some more history when the Hamilton Bulldogs host the Toronto Marlies in the league’s first outdoor contest staged in Canada. Dubbed the Steeltown Showdown, this Saturday’s game from Ivor Wynne Stadium in Hamilton will be televised live with coverage beginning at 12:30 p.m. ET on Sportsnet in all four broadcast regions across Canada. It will also re-air on NHL Network in the U.S. at 3 p.m. ET on Sunday. Located 40 miles apart in southern Ontario, the Bulldogs and Marlies have been rivals since 2005, when the Maple Leafs moved their AHL affiliate to Ricoh Coliseum. Saturday’s game will be the 75th all-time meeting between the teams. The North Division foes will have plenty at stake when they hit the Ivor Wynne ice. While Toronto enters the week atop the division, Hamilton sits four points out of eighth place in the Western Conference. 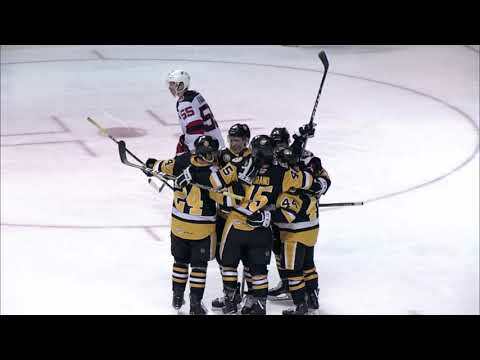 SHORT STACKS … Wilkes-Barre/Scranton was a perfect 5-for-5 killing penalties on Jan. 14 in St. John’s, but it was three shorthanded goals that propelled the Penguins to a 6-4 win over the IceCaps. Ben Street scored on a shorthanded penalty shot late in the second period, and with the IceCaps headed back to a power play in a 3-3 game midway through the third, Bryan Lerg and Joey Mormina scored 21 seconds apart to send the Penguins to victory. Wilkes-Barre/Scranton became the first AHL team to score three shorthanded goals in one game since Apr. 8, 2009, when Quad City did it in a 5-2 win over Rockford. There was a run on shorties in Springfield also, as the Falcons scored four times while shorthanded during a home-and-home series against Portland. Ryan Garlock and Cam Atkinson scored 58 seconds apart on the same disadvantage on Jan. 13, and then Atkinson and Alexandre Giroux scored man-down goals the next night. The Penguins and Falcons enter the new week with nine shorthanded goals each on the season, tied with Hershey for the most in the AHL. SOMMER OF ’97 … Roy Sommer has history in his sights as his Worcester Sharks embark on a three-game weekend. While the Sharks prepare for a visit to Providence on Friday followed by home games with the Bruins on Saturday and St. John’s on Sunday, Sommer sits with 497 wins during his 14 seasons as an AHL head coach. Only AHL Hall of Famers Fred “Bun” Cook (636), Frank Mathers (610) and John Paddock (589) have reached the 500-win plateau in league history. TIGERS BURNING BRIGHT … Bridgeport has put together one of the more improbable winning streaks in the AHL this season, and it has lifted them to within two points of first place in the Northeast Division. The Sound Tigers went 2-10-1-1 between Nov. 26 and Dec. 31, finishing 2011 with nine losses in their last 10 games. But since turning the page on the calendar, Bridgeport has won seven in a row, stringing together the franchise’s longest streak of W’s since a nine-game run in November 2003. The streak began with Kevin Poulin’s back-to-back-to-back shutouts, and has continued with Anders Nilsson picking up the last three wins following Poulin’s recall to the NHL. Rhett Rakhshani (6-5-11, +8), Matt Donovan (1-9-10, +7) and Casey Cizikas (3-5-8, +8) have led the Sound Tigers’ offense, which has scored at least three goals in all seven games after reaching that mark just twice in the previous 10 contests. CRUNCH ROLL WITH PUNCHES … The addition of Trent Yawney to the Syracuse coaching staff last week seemed to provide a quick boost to the Crunch. Yawney, who had been a scout with the parent Anaheim Ducks, was brought in as associate head coach on Jan. 10, with Mark Holick being kept on as associate coach and Marty Wilford remaining assistant coach. In Yawney’s first game behind an AHL bench since he was promoted from Norfolk to the Chicago Blackhawks in 2005, the Crunch got 35 saves from Marco Cousineau in his AHL debut and defeated Binghamton, 5-2, on Jan. 13. Syracuse, which finished the weekend with a shootout win in Albany and a shootout loss at Worcester, is three points out of eighth place in the Eastern Conference. QUICK HITS … Referees Marcus Vinnerborg and Jeff Smith and linesmen Ryan Lachine and Kevin Ferguson have been selected to officiate Saturday’s outdoor match in Hamilton… Hershey’s Keith Aucoin has an assist in 13 straight games (3-22-25), four games shy of the AHL record held by Shaun Van Allen (1992-93) and Peter White (1993-94)… Manchester forward Marc-Andre Cliche, 0-for-4 in shootout attempts in his first four seasons combined, is 6-for-6 this year… Michael Davies scored a goal in three straight games for Chicago last week after being held without a goal in his previous 26 AHL contests… Ben Street, whose parents hail from Newfoundland, scored the overtime winner for Wilkes-Barre/Scranton on Jan. 15 with family in attendance at Mile One Centre in St. John’s… The Penguins will play their 1,000th regular-season game when Manchester visits the Mohegan Sun Arena on Friday night… Houston had lost its first seven shootouts of the season before prevailing in Grand Rapids on Jan. 11… After a penalty-killing rut of allowing 15 goals in 37 times shorthanded, Rockford has successfully killed off 17 straight opponent power plays… On Jan. 21-22, Grand Rapids will host its 10th annual Great Skate, a 24-hour skate with Griffins players, coaches and staff to raise money for the team’s youth foundation.